PROMISE OF GLORY, by C. X. Moreau, Reissued in Paperback and eBook | Welcome to Endpapers Press! Over the years, I have worked with many authors, but few have impressed me with their skill and character as C. X. Moreau. A former marine who served in Beirut, he is the author of Distant Valor and Promise of Glory: A Novel of Antietam. Both were originally published by Forge Books, an imprint of Tom Doherty Associates, and I’m exceptionally pleased that I have now been able to reissue both in trade-paperback and eBook format via Ignition Books, an imprint of Endpapers Press. August 1862—Federal armies threaten Richmond, the Confederate capital. From the east, the Army of the Potomac, commanded by General George McClellan, has edged closer to the city until the citizens of Richmond are able to listen to their church bells and the report of cannon with equal clarity. Late in the summer, President Jefferson Davis gives command of the Rebel army to the untried Robert Edward Lee. It is a momentous decision. In a series of battles fought virtually in sight of the city, Lee defeats the Army of the Potomac, then turns and drives the Union Army back to Washington, DC. Now, in the first week of September, the days are long and hot. Roads muddied by summer rains dry. There is time yet for one last campaign, a battle that could bring about the end of the war, and ensure a southern nation. This is the story of that campaign. This is the story of the Battle of Antietam, the bloodiest day of the Civil War. 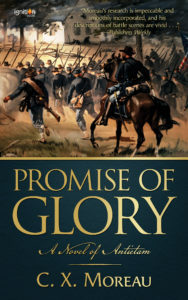 Promise of Glory and Distant Valor are available through all major online booksellers and may be ordered by your favorite brick-and-mortar bookstore via Ingram. This entry was posted in Endpapesrpress and tagged C. X. Morea, Ignition Books. Bookmark the permalink.